Sixteen states are coming before the United Nations Human Rights Council for a review of their human rights records. The exercise, known as the Universal Periodic Review, brings forward a U.N. member state once every four years for a conversation about the human rights situation in its country. 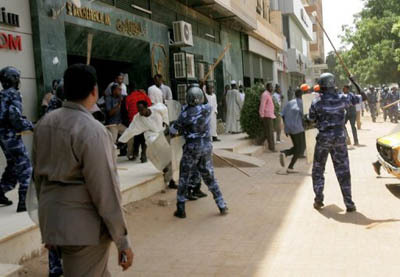 Among those scrutinized this week is Sudan, a country whose regime has shown little interest in the protection and respect of the human rights of its citizens. Government actions and rhetoric in recent months have underscored the sense that after the South’s fast-approaching secession on July 9, the human rights situation in northern Sudan will only deteriorate. Since January, government security forces have consistently responded to protests throughout the North with arbitrary arrests and detainments, and increasingly, torture and sexual assault. Violence in Darfur in December involved the targeting of civilians by the Sudanese army and its affiliates. (Human Rights Watch has also documented targeted attacks on civilians by Darfuri rebels, and human rights abuses by the South Sudanese army and a southern rebel group in clashes in recent months.) In a speech in December, President Bashir announced that he intends for Sudan—an ethnically and religious diverse country—to be an Islamic state with strict adherence to Sharia law and no “diversity of culture and ethnicity” after the South separates, which will only serve to exacerbate the tensions that led to unrest in the first place. The Universal Periodic Review is an opportunity for the U.S. and its partners “to signal that the international community will continue to closely monitor and demand improvements in the Khartoum government’s human rights and religious freedom record,” said the United States Commission on International Religious Freedom in a letter to Assistant Secretary of State Esther Brimmer. Aside from examining the Sudanese government’s poor record, tomorrow’s review is a chance to publicly question and pressure the two Sudanese governments on impending decisions that will have a tremendous impact on the human rights situation in both Sudans going forward. In particular, Human Rights Council members participating in Sudan’s review should emphasize to both the Sudanese and South Sudanese governments the importance of an inclusive constitutional review process and a post-secession citizenship policy that protects minority rights. How these issues are addressed by the two governments will be a major factor in whether conflict emerges in either state after secession. Sudan’s long history of conflict is widely understood as a consequence of policies that revoked the political, cultural, religious, and economic rights of certain communities for the benefit of others. An inclusive constitution drafting process in the North and South will help ensure that basic freedoms and rights for the people are enshrined in the two countries’ new constitutions. Citizenship laws should not discriminate nor pave the way for expulsions and recriminatory attacks against any community in either state. On July 9, much work remains to ensure that there is sustained peace in both Sudans. Pushing the two Sudanese governments, particularly Khartoum, toward a stronger commitment to human rights is one step toward that goal. Look out for Sudan’s review tomorrow, which may be webcast on the Universal Period Review website at 8:30 a.m. tomorrow EST, and the outcome report from the review, which will provide a summary of the discussion.